The story of the Civil War-era Washington Nationals, precursor to today’s team, is fascinating look into the earliest origins of the national pastime. Much has changed — the players were expected to pay to participate and there were no mitts or catcher’s masks. But the Nationals became the first sports team invited to the White House, the first to publish a box score, and the first to go on tour. The story of the Nationals, from their games on the field adjacent to the White House, from their ground-breaking tour to playing an all-black team that featured the son of Frederick Douglass, the book is illustrated with fascinating details and rare artifacts. “It started innocently enough when a group of mostly Federal Government employees decided they should take a cue from their counterparts up north and form an organized baseball team. That team would be known as the National Base Ball Club. At first, the young men simply wanted to play ball, get a bit of exercise, and enjoy the open space around the Mall area. Things progressed from there. 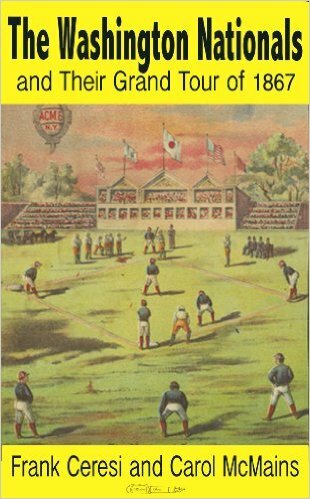 A careful review of the activities of the Nationals from their inception, during the Civil War, and throughout the key decade of the 1860’s clearly illustrates that the city’s Nationals would become quite significant to the development of the national pastime and the spread of its popularity.